Outskirts Press features one of our successful authors each week and we want to spotlight Micheal Andrisano, the author of four books through Outskirts Press: Operation Seeding: Rain Rain Go Away Come Again Another Day, and its sequel, Extended Forecast: Global Chaos along with two other books, Harold the High Knight and Princess Megan and Christianity Karma and Reincarnation: A New Message Begins. Learn more about Micheal and his repertoire of work in this week’s Self-Publishing Author Spotlight. Mike Andrisano is retired, living in New Jersey with his wife. 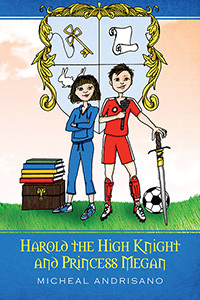 Harold the High Knight and Princess Megan is a story that was developed in and around the countryside surrounding his wife’s family’s ancestral town of Tournafulla, County Limerick, Ireland. 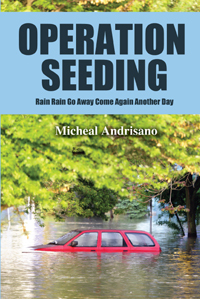 Operation Seeding is a book that was developed over several decades. Things just haven’t been the same for Harold and Megan since their father mysteriously disappeared. But one night, a ghostly visitor tells Harold that his father is being held captive by a mad gnome from Germania named Gagle the Great. To find the lair of the mad gnome, Harold must solve a riddle. Harold loses all hope; he hates puzzles of all kinds. But a magical box that belonged to his father may hold a clue. When Harold relates his strange tale to his family, his mother refuses to believe it, and thinks Harold is making up stories to console him for the loss of his father. But Megan knows there’s more to it. Against their mother’s wishes, Harold and Megan turn to their classmates for help. But when nobody can solve the riddle, they must convince their mother that their father is in danger, and that they must travel to Ireland to seek the help of his relatives and friends. Little do they know what awaits them on the Emerald Isle: the mad gnome is the enemy of fairy folk, and they receive some special help from the Mayor of the Leprechauns, as well as from a surprise visitor who appears when hope is lost. Will Harold and Megan find their father, and can they rescue him before time runs out? Follow them across the ocean and into a magical world as they explore the realm of enchantment. The anti-climate control lobbies are having a field day, their accusations shrieking from the headline of every newspaper, worldwide. It is now accepted as fact that HT Wetco had flown under the radar to single-handedly sabotage the weather around the entire planet. As the repercussions of climate interference spiral out of control, with economies and living conditions impacted around the globe, the trial of the century unfolds. As their largest man made storm Hurricane Susan is bearing down to strike along the eastern seaboard, coincidence, or a deliberate sabotage effort perpetrated by HT Wetco, with the blessings of the US government. As this extreme weather event begins Chinese General Ly N Ming and his men begin their attack in Lorton, Virginia. While unbeknownst to many a former Russian KGB agent, Günter and the Muslim Brotherhood now plot to bring nuclear destruction to America. While Luther and Juan travel From Moscow to Madagascar seeking the whereabouts of the madman Günter. In America Clara, Brad and a new ally Joan Romanski of the Russkaya Mafiya seek the information they need in helping stop the attack. In the center of it all is Todd Thurston grandson and now CEO of HT Wetco. His allies confident in their knowledge that whoever controls the weather will also control the world. 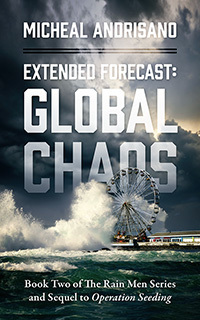 A deftly plotted thriller showing you a world that modern technology has created, Extended Forecast: Global Chaos is the second book in the compelling trilogy that began with Operation Seeding, which now has a following around the world. Operation Seeding will be published in an updated edition to coincide with the release of Global Chaos.